Here are Las Vegas Hilton hotels on and near the Strip with a helpful map. If you want to stay in a luxurious all-suite Las Vegas Hilton hotel that is on the Strip within walking distance to several major attractions, then the Elara by Hilton Grand Vacations Center Strip is a superb selection. Located directly on the Strip, the Elara by Hilton Grand Vacations Center Strip boasts 1,201 suites that range from studios to four-bedrooms which have a chic decor, kitchenettes, sofa sleepers, multiple bathrooms, and floor-to-ceiling-windows with a variety of views available. Complimentary amenities include a fitness center and an outdoor swimming pool. Dining includes the Poolside Bar and Grill, the Lobby Bar features cocktails with small plates and there is in-room dining available for all three meals. Offsite dining close by includes numerous options within the Miracle Mile Shops, Lobster ME and La Salsa. Nearby entertainment is loaded with the V Theater, the Saxe Theater and the Fountains of Bellagio. 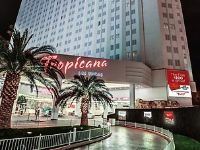 A superb Las Vegas Hilton hotel on the Strip that has went through a thorough renovation a few years ago is the Tropicana Las Vegas-A Doubletree by Hilton. 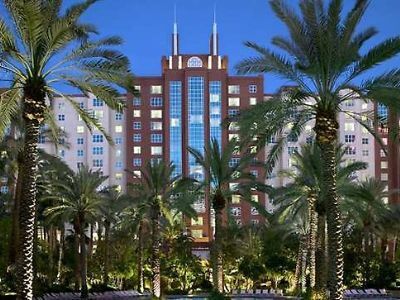 Located directly on the Strip, the Tropicana Las Vegas-A Doubletree by Hilton has 1,876 rooms and suites which feature an updated South Beach style interior with a choice of bedding, a variety of views available and some have balconies. The hotel has a few free amenities such as a fitness center, business center and there is an indoor/outdoor swimming pool with a hot tub, swim-up bar and gambling. Other amenities and entertainment options onsite include the GLOW, a Mandara Spa, a lively casino with sports book, the Laugh Factory, the Tropicana Lounge for live music, and the Sky Beach Club. Dining onsite features the South Beach Food Court, Savor Brunch Buffet, Oakville Steakhouse, Chill’m and Bacio Italian Cuisine. 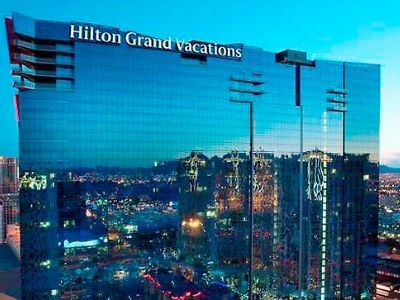 The Hilton Grand Vacations Suites-Las Vegas Convention Center is an ideal Las Vegas Hilton hotel for extended stays in large suites with many amenities available. 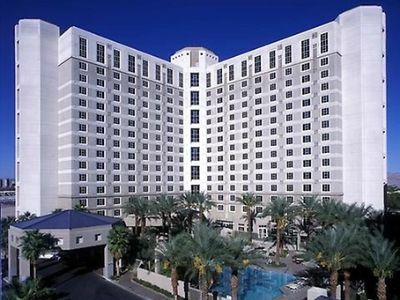 Located within a ten minute walk to the Las Vegas Convention Center, the Hilton Grand Vacations Suites-Las Vegas Convention Center features 404 suites from studios to two bedrooms which have a modern contemporary interior, choice bedding, kitchenette or full kitchen, separate living areas, some with laundry facilities, and multiple bathrooms in larger units. The hotel has several complimentary amenities which include a fitness center, business center, Wi-Fi, tennis courts, a children’s game room, and an outdoor swimming pool with hot tub. There is no restaurant onsite but quick bites and groceries are available at the Marketplace which is a deli style convenience store. Restaurants within a short walk include Edge Steakhouse, Benihana and Fat Choy. Entertainment is plentiful within walking distance including numerous shows at the Westgate Resort, Stratosphere Tower and Escapology. 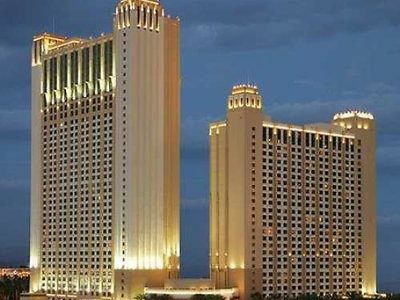 A superb Las Vegas Hilton hotel for you to try that is directly on the Strip and offers spacious all-suite accommodations is the Hilton Grand Vacations Suites on the Boulevard. Located on the Strip, the Hilton Grand Vacations Suites on the Boulevard features 1,228 suites that range from studios to three-bedrooms with a contemporary interior, kitchen or kitchenette, sofa sleeper, larger suites have separate living areas, and in-room laundry facilities. The hotel offers free Wi-Fi, a fitness center, business center, outdoor sport courts, shuttle to the Las Vegas Convention Center, and there are two outdoor swimming pools with three hot tubs. Other amenities include the 4,000 square foot Eforea Spa. The Market Place has quick bites, Waves Pool Bar and Grill serves lunch and the Lobby Bar boasts nightly entertainment. Dining close by includes the Golden Steer Steak House and Bazaar Meat by Jose Andres. Entertainment within walking distance includes the Strip Gun Club, Vegas Indoor Skydiving and the Stratosphere Tower. 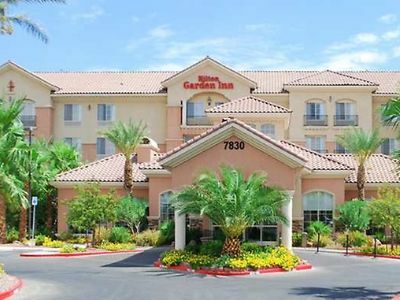 A great choice for a Las Vegas Hilton hotel when you want to stay away from the hustle and bustle of the Strip is the Hilton Garden Inn Las Vegas/Henderson. 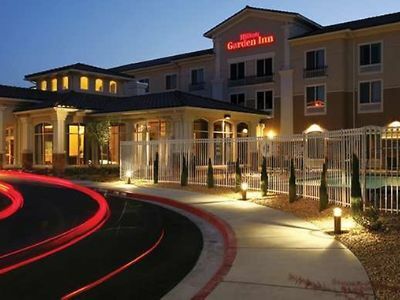 Located in the Green Valley area of Henderson, the Hilton Garden Inn Las Vegas/Henderson offers 151 rooms and suites with a comfortable interior, choice of bedding, small kitchenette, and suites have separate living areas with a sofa sleeper. The hotel boasts several free amenities which include Wi-Fi, a fitness center, business center, tennis courts, airport shuttle, and an outdoor swimming pool with hot tub. Rachel’s Kitchen offers all three meals and the Pavilion Pantry has snacks 24 hours a day. Dining nearby includes the Great Greek, Sierra Gold and Genghis Grill. Entertainment in the neighborhood includes Strike Bowling, the Las Vegas Distillery and the Henderson Bird Viewing Preserve. Families searching for a Las Vegas Hilton hotel that boasts suites and numerous amenities near the Strip should try the Hilton Grand Vacations Flamingo. 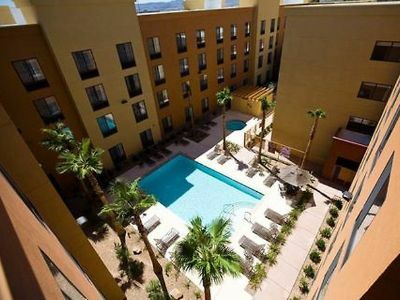 Located steps away from the Strip, the Hilton Grand Vacations Flamingo features 303 studios and suites which are furnished with modern interior, king size bed, a sofa sleeper, small kitchenette, and a separate living area. Suites offer separated living/dining areas and laundry facilities. The hotel offers several complimentary amenities which include a fitness center, Wi-Fi and an outdoor swimming pool with hot tub. The onsite Market Place serves all three meals and has a well-stocked convenience store. Dining options nearby include Jaburritos, the Yard House and Off the Strip. Entertainment within 20 minutes features the Brooklyn Bowl, the High Roller and the Flamingo Wildlife Habitat. A stellar extended stay Las Vegas Hilton hotel for business travelers and families looking for spacious suites is the Home2 Suites by Hilton Las Vegas South. 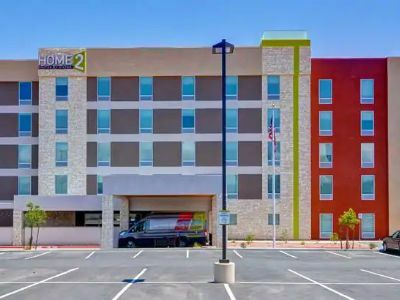 Located three miles from the Strip, Home2 Suites by Hilton Las Vegas South has 120 studios and one bedroom suites that feature a sleeper sofa, separate living area, small kitchenette and a modern minimalist interior. The hotel features several complimentary amenities like breakfast, airport shuttle, fitness center, business center, Wi-Fi, parking, and an outdoor swimming pool. There is not a restaurant onsite but the Home2 Suites Market is open 24 hours a day for snacks. Dining within an easy walk includes L & L Hawaiian BBQ, Villa Fresh Italian Kitchen and Steiner’s Nevada Style Pub. Entertainment within a 30 minute walk includes the Las Vegas Premium Outlets South, Shelby American, Inc. and Town Square Las Vegas. The Hilton Garden Inn Las Vegas City Center is a superb choice for travelers looking for comfortable Las Vegas Hilton hotel near the Strip. 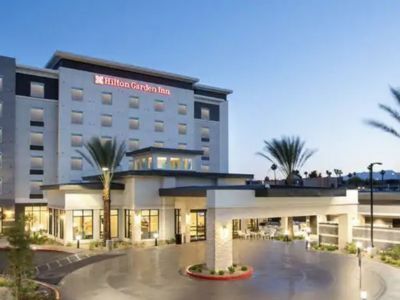 Located two blocks off the Strip near the City Center, the Hilton Garden Inn Las Vegas City Center has 172 rooms with a choice of bedding, small kitchenette and a modern interior. The hotel offers a few complimentary amenities including a fitness center, business center, outdoor swimming pool and hot tub, Wi-Fi, parking, and a shuttle to selected spots on the Strip. Dining onsite includes the Garden Grille and Bar which is open for all three meals and the Pavilion Pantry has snacks 24 hours a day. Restaurants within walking distance include the Blind Pig, Blossom and Bardot Brassiere. Entertainment within a short walk includes Fountains of Bellagio, Park Theater, Las Vegas Shooting Center, and the Miracle Mile Shops. A nice choice for a Las Vegas Hilton hotel that is perfect for families and business travelers looking to be close to the action is the Hilton Garden Inn Las Vegas Strip South. Located along the southern section of the Strip, the Hilton Garden Inn Las Vegas Strip South features 155 rooms and a variety of suites which are furnished with a modern decor, small kitchenette and a choice of bedding. There are suites available with balconies and separate living areas with a sofa sleeper. The hotel offers some free amenities such as an outdoor pool and hot tub, Wi-Fi, business center, tennis courts, fitness center, an airport shuttle and shuttle to Mandalay Bay. The 24 hour Pavilion Pantry as well as the Pavilion Lounge and the Great American Grill is open for all three meals. Offsite dining choices include the Bootlegger Bistro and Black Bear Diner. Entertainment nearby includes the Magic of Seth Grabel and the Silverton Aquarium. When you want to stay at a Las Vegas Hilton hotel with your family or on business that is off the Strip with spacious suites then you should try the Homewood Suites by Hilton Henderson South Las Vegas. 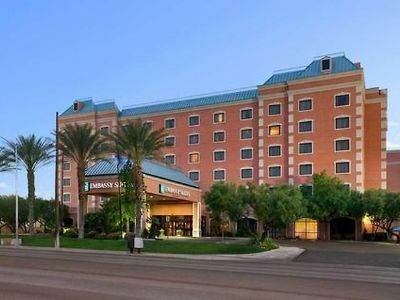 Located in Henderson south of the Strip, the Homewood Suites by Hilton Henderson South Las Vegas features 145 studios and suites which are furnished with a full kitchen, choice of bedding, a separate living area, and a modern minimalist interior. Some suites have a balcony or fireplace. The hotel offers several free amenities including breakfast, Wi-Fi, fitness center, business center, airport shuttle, and an outdoor swimming pool. There is not a restaurant onsite but there is a 24 convenience store and free grocery service available. Other dining options within walking distance include Fausto’s Mexican Grill, Buon Gusto and Blake Pizza. Entertainment nearby includes Lion Habitat Ranch, Axe Monkeys and Kettlemuck Toy Shoppe. A superb alternative for a luxury Las Vegas Hilton hotel that is situated away from the Strip is the Hilton Lake Las Vegas Resort and Spa. Located on Lake Las Vegas, the Hilton Lake Las Vegas Resort and Spa has a Mediterranean inspired exterior with 347 rooms and suites that offer a fresh interior and views of Lake Las Vegas. The hotel has numerous amenities such as a business center, fitness center, shuttle to the Strip, tennis courts, an outdoor swimming pool with a lagoon and beach area. The spa has 24 treatment rooms, a plunge pool, outdoor terrace, and salon. Breakfast and lunch are served at Medici Cafe and there are plenty of dining options at the Village at Lake Las Vegas. 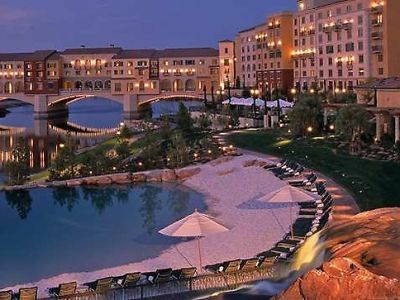 Entertainment and shopping can also be found within the Village at Lake Las Vegas. You can also arrange a number of outdoor activities on Lake Las Vegas such as jet skiing, boating, water skiing, and kayaking. A great option for a Las Vegas Hilton hotel that boasts spacious suites with numerous amenities is Homewood Suites by Hilton Las Vegas Airport. 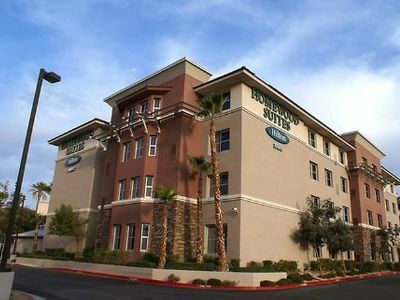 Located near McCarran International Airport, Homewood Suites by Hilton Las Vegas Airport offers 146 one and two bedroom suites that are furnished with a modern interior, choice of bedding and a small full kitchen. Complimentary amenities include breakfast, Wi-Fi, fitness center, business center, outdoor swimming pool, putting green, parking, and there is an airport shuttle. There is no restaurant onsite but you can purchase snacks 24 hours at the onsite convenience store and there is free grocery service to help you stock your kitchen. Attractions within a 30 minute walk include the Town Square Las Vegas and Las Vegas South Premium Outlets. The Tru by Hilton Las Vegas Airport is an ideal choice for travelers looking for easy access to the airport and no non-sense amenities. 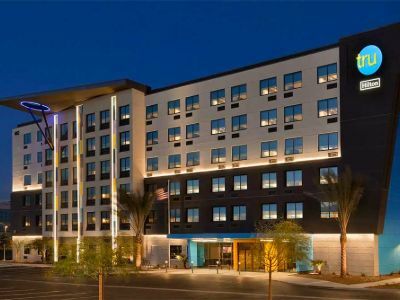 Located near McCarran International Airport, this Las Vegas Hilton hotel boasts 166 rooms with a fresh modern minimalist interior with choice of bedding. The hotel has many free amenities to please you such as a breakfast bar every morning, business center, fitness room and you can enjoy complimentary beverages as well as billiards within the colorful eclectic lobby area. There is no restaurant onsite but you can purchase snacks at the 24 hour Pantry Shop. The hotel offers a 24 hour free shuttle service to the airport and selected stops on the Strip. Attractions within a 30 minute walk include the Las Vegas South Premium Outlets, the Welcome to Fabulous Las Vegas Sign and Town Square Las Vegas. If you are seeking spacious rooms with free breakfast in a non-gambling Las Vegas Hilton hotel, then Embassy Suites by Hilton is a perfect choice. Embassy Suites by Hilton boasts 220 one or two room suites that have a modern interior, a choice of bedding and a small kitchenette. The hotel has several free amenities which include a breakfast bar, Wi-Fi, swimming pool and hot tub, fitness center, business center and a small gift shop. Other shopping options nearby include the Boulevard and Fashion Show Mall. The hotel has meeting space available to rent and the hotel can host wedding receptions. You receive a complimentary breakfast daily at this Las Vegas Hilton hotel. Lunch and dinner is served at the Three Palms Restaurant and nightlife onsite includes Coconuts Lounge. For gaming and entertainment opportunities there is a free shuttle to the Strip as well as complimentary shuttle service back to McCarran International Airport.